When a Dutch monarch dies or abdicates, he or she is succeeded by his/her eldest child. If the eldest child dies before the monarch but has legitimate children, the oldest of these children succeeds his or her grandparent. If, however, the monarch has no legitimate descendants, the succession passes to other members of the Royal House in a set order, laid down in article 25 of the Constitution. Princess Beatrix succeeded her mother, Queen Juliana, on 30 April 1980. Exactly 33 years later, on 30 April 2013, she was succeeded in turn by her son, Prince Willem-Alexander. At that point Princess Catharina-Amalia, the Princess of Orange, became first in line to the throne. Amsterdam, 30 April 2013: King Willem-Alexander swears his allegiance to the Charter for the Kingdom of the Netherlands and to the Constitution. The rules governing succession to the throne are enshrined in article 25 of the Constitution. The last revision of the Constitution laid down that the monarch is to be succeeded by his/her eldest child, regardless of whether that child is a son or a daughter. If the eldest child has died but has legitimate children, his or her oldest child will succeed. But if the monarch has no children or grandchildren, the throne passes to the descendants of his parent or grandparent, provided they are not further removed from the deceased King than the third degree of consanguinity. When Prince Willem-Alexander became King, therefore, the two oldest sons of his aunt Princess Margriet lost their right to succeed. If no heir can be found within the House of Orange-Nassau, a successor may be appointed by Act of Parliament, which must be passed by both Houses of Parliament meeting in joint session. Princess Catharina-Amalia, the Princess of Orange, is now first in line to the throne because she is King Willem-Alexander’s eldest child. If she becomes Queen while still a minor, a regent will be appointed to exercise the royal prerogative on her behalf. Next in line after the Princess of Orange come her younger sisters Princess Alexia and then Princess Ariane. If they could not succeed for some reason, Prince Constantijn, followed by his children, Countess Eloïse, Count Claus-Casimir and Countess Leonore, would be next in line. The last in line of succession is Princess Margriet. Under the Membership of the Royal House Act, the Royal House comprises the members of the royal family who are related to the monarch in the first or second degree of consanguinity and their spouses. Under the Constitution, only relatives of the monarch in the first, second and third degree of consanguinity may succeed to the throne. Spouses of the monarch’s relatives are not eligible for succession to the throne, although the spouses of his relatives in the first and second degrees of consanguinity are members of the Royal House. Degrees of consanguinity are measured by the distance from a common ancestor or descendant, either in the direct or collateral line. The direct line of descent is as follows: great-grandparent, grandparent, parent, child. The distance from grandchild to grandparent is two degrees in the direct line, while that from child to parent is one degree. This means that the Princess of Orange is related to the King in the first degree. A relationship in the collateral line involves more steps than one in the direct line. The degrees in the collateral line measure the distance to a brother or sister, an aunt or uncle or a cousin. Degrees in the collateral line are determined by counting back to the common ancestor, and from there to the relatives in the collateral line (two steps means a relative in the second degree, three steps means a relative in the third degree). For example: Prince Constantijn is related to the King in the second degree, and to the Princess of Orange in the third degree. There is no parent-child relationship, but the people in question share a parent/ancestor: Princess Beatrix. N.B. Brothers and sisters cannot be related in the first degree; that is only possible between parent and child. When Prince Willem-Alexander became King, Princess Margriet’s children lost their right of succession, since only those who are relatives of the King in the first, second and third degrees of consanguinity are eligible to succeed to the throne. Membership of the Royal House, on the other hand, requires a relationship to the King in the first or second degree. Members of the Royal House in line to the throne also lose their right of succession if they marry without Parliament’s consent. This was the case, for example, in 2004, when Prince Friso married Mabel Wisse Smit. The same applied to the marriages of Prince Floris (2005), Prince Pieter-Christiaan (2005), Princess Christina (1975) and Princess Irene (1964). 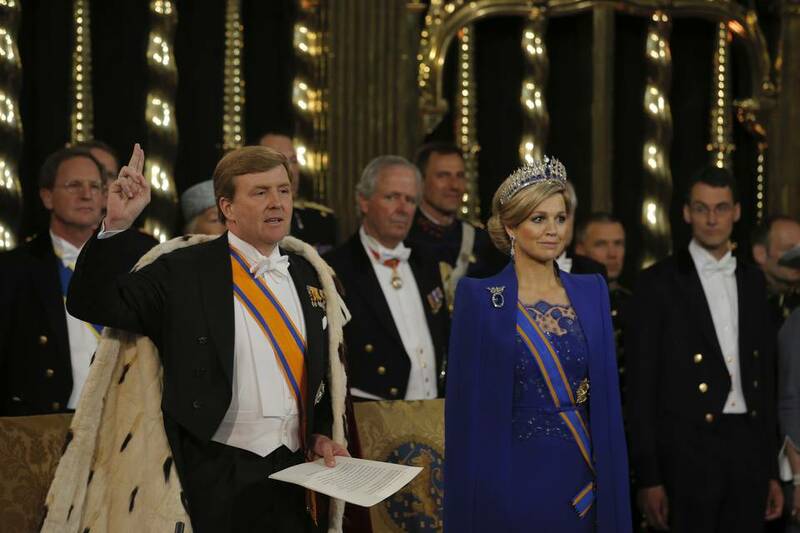 Although monarchy is for life, the Dutch Constitution makes provision for abdication. A tradition has grown up of monarchs relinquishing the throne: King Willem I, Queen Wilhelmina, Queen Juliana and Queen Beatrix have done so to date. The monarch personally determines the time of abdication, and is succeeded by the next in line to the throne.